Hail To The Ale: Dryhop Brewers and Flossmoor Station Launch "Smoking Nanners"
Dryhop Brewers and Flossmoor Station Launch "Smoking Nanners"
Join Dryhop Brewers and Flossmoor Station Brewing tonight at Dryhop (3155 N. Broadway) for the release of their collaboration "Smoking Nanners". 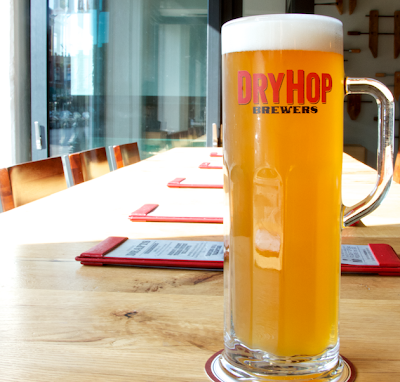 The 5.5% Smoked Hefeweizen, is a result of Flossmoor Head Brewer Bjorn Johnson and Dryhop Owner Greg Shuff’s time together in Munich for brew school. Together, they traveled to different regions of Germany to learn about brewing techniques. A memorable stop was in Bamberg, where smoked beers are considered a specialty of the area. Smoking Nanners was brewed in tribute to Bjorn and Greg’s antics experienced there. DryHop Chef Pete Repak and Flossmoor Chef Eduardo Camarena also collaborated on a dish for the evening – Smoked Guajillo Chile Glazed Texas Quail on Jicama-Tortilla Salad with Roasted Pineapple Relish and Pulped Avocado.